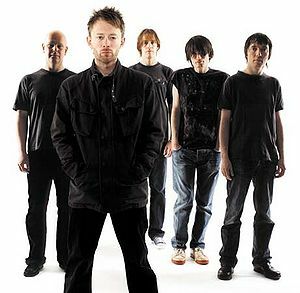 Among Radiohead members' earliest influences were Queen and Elvis Costello; post-punk acts such as Joy Division and Magazine; and significantly 1980s alternative rock bands such as R.E.M., Pixies, The Smiths and Sonic Youth. How do you feel about the new grown-up British rock bands - people like Radiohead or Coldplay? Well I certainly envy the way they've been promoted, because I have never experienced that. With Coldplay, if you fail with that amount of promotion you must be pretty atrocious. They have been hammered into American society. The music bystifies me, because I don't understand why I have the monopoly on the word "miserable." Both of those bands sound very unhappy, with not a sign of a witty lyric. I might be wrong but I don't understand how they've escaped that accusation. I can't say I've enjoyed their records, no. ...In the driveway, he asked a favour. He wanted to modify a few things he said. "Please don't have me say anything unpleasant about Coldplay and Radiohead," he said. "There's no point to it, it just looks silly and mean. They're perfectly good bands, they're just not to my taste." You called them Oldplay and Radiodead. "I know. But I say a lot of things I don't mean." And that was something I'd never heard from Morrissey before. Radiohead covered "The Headmaster Ritual" in a studio webcast (Nov. 2007). While talking about Thom Yorke being a gymnast in high school, Radiohead guitarist Ed O'Brien says "It's like how Morrissey was a great long-distance runner in high school - nobody knows that, either". Later on the article says that The Smiths are one of the bands top two influences, whom all 5 members love unequivocally. "My suggestion for OK Computer's follow-up had been to say, Let's go back top the well-crafted three-and-a-half minute song. I came from idolising The Smiths in the 80's and I thought that would be the shocking thing to do. It was really difficult because, as a musician, I express myself more emotionally then cerebrally." ↑ Stephen Thomas Erlewine. Biography: Radiohead. AllMusic.com. Retrieved from AllMusic.com. ↑ Radiohead Wikipedia page. Wikipedia. Retrieved from wikipedia.org. ↑ Andrew Harrison. (2003-06). [Interview] Word - June 2003. Word. Retrieved from morrissey-scans.tumblr.com. ↑ Radiohead cover "The Headmaster Ritual" on Radiohead.tv webcast (Nov. 9) (2007-11-12). Morrissey-solo. Retrieved from morrissey-solo.com. This page was last modified on 8 April 2013, at 08:08.